Happy Monday! Ugh the Monday after Christmas is such a bummer. I don't know about you but I'm sad that the holiday's are about to end. Did you have a good Christmas? We spent a lot of time at home and with family - it was perfect. Did Santa bring you anything good?? My pal Lacey, of My Boring Closet, and I shot these fun looks a few weeks ago in collaboration with Denver Street Boutique (one of our favorite local fashion truck boutiques) and it was a ton of fun! 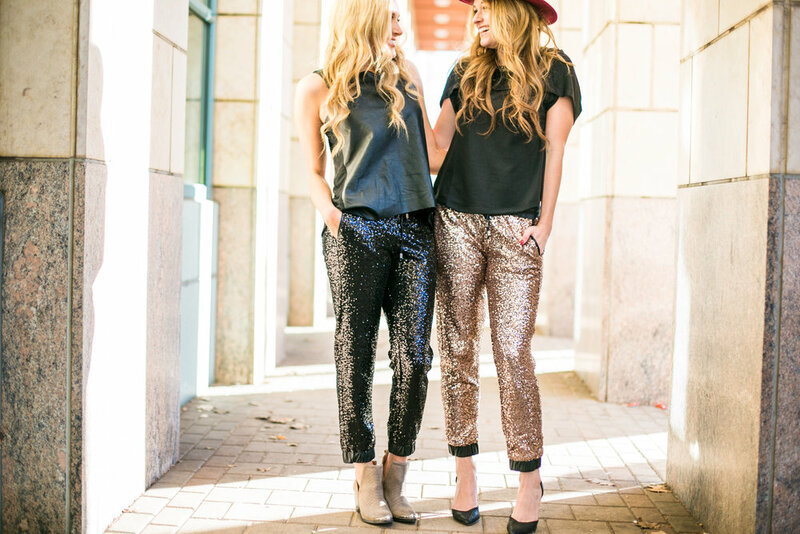 Sequin joggers are ALL over the internet and social media right now - it is the time of year after all. But I love it. I'm obsessed with sequins right now! These joggers are super fun for New Years (maybe you're a procrastinator like me and STILL don't have your outfit planned). They're also fun for events or just dressing down with a fun graphic tee. There are plenty of ways to wear these post holiday season - get creative and mix the unexpected items you already have in your closet, like tees or sweaters. I have a look coming up that shows how to dress down a sequin skirt so stay tuned! I also have a giveaway coming up both this week and next so be sure to follow me on Instagram for all the details! You can see Lacey's Sequin Jogger post here.